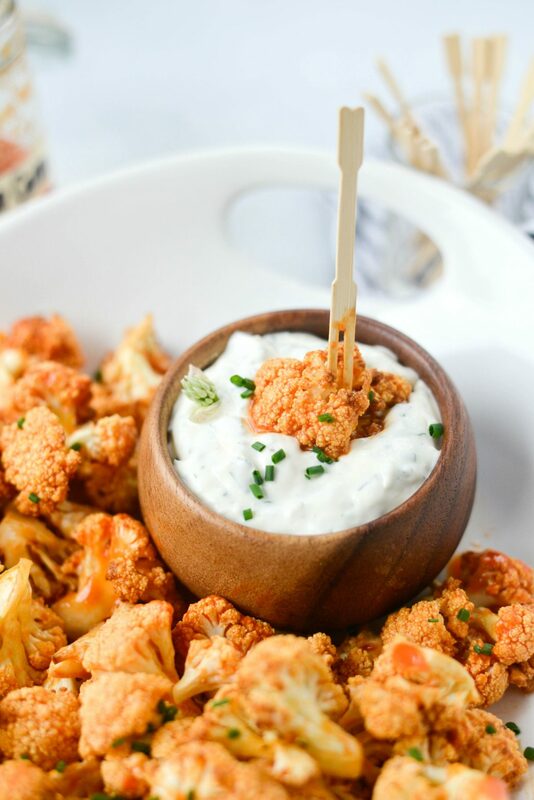 Air Fryer Buffalo Cauliflower Bites are a delicious vegetarian snack! 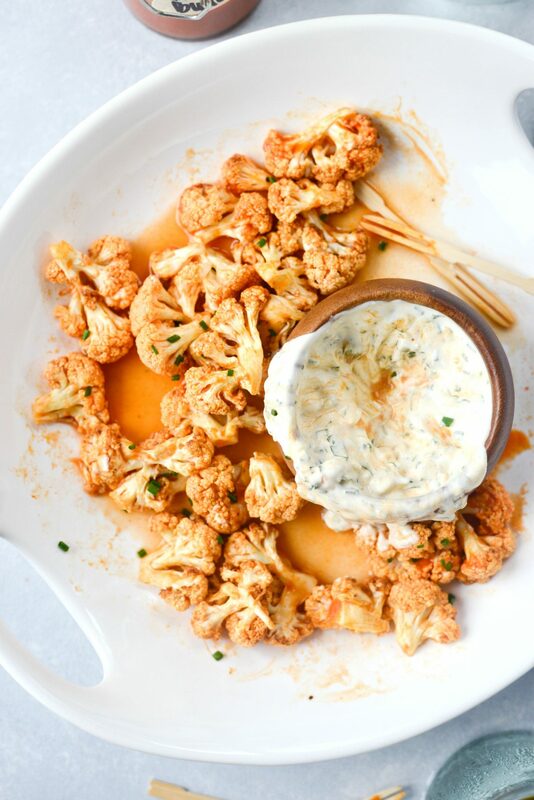 Cauliflower florets are quickly air fried and tossed in a homemade buffalo wing sauce and served with a garlicky blue cheese dip. Serves 4 to 6 in under an hour. 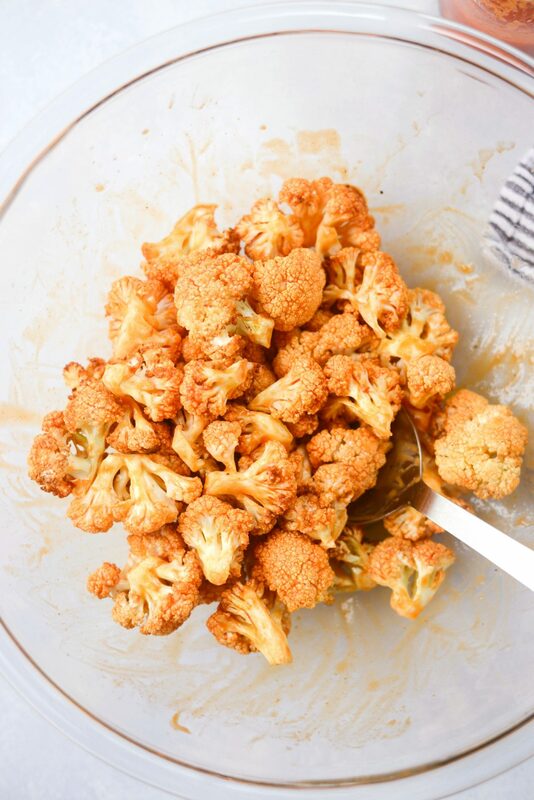 If the dip is made a day in advance, then the cauliflower only takes about 20 minutes. It’s been SO hot. Michigan temperatures have been in the high 80’s to low 90’s and if you recall, our central air broke at the tail end of last summer. We thought we had plenty of time before it got “really” hot, it is Michigan after all, but no. It was 90 degrees IN MAY! Even with all the windows open and multiple fans going it was still too hot to cook, clean… breathe (drama). We’d head out for shopping just to get out of the sweltering heat and into some air conditioning. Plus it didn’t help I was sporting a sunburn from Memorial Weekend. 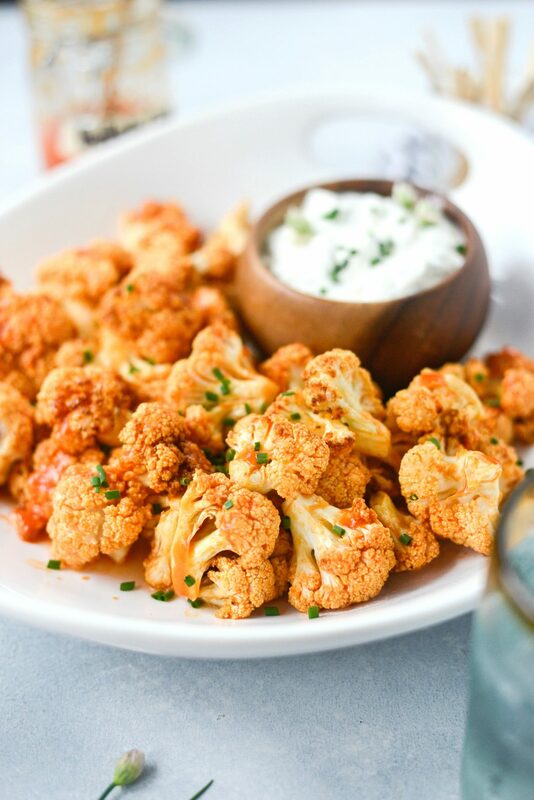 On the first cool-dish day, I busted out my air fryer (again) because I was dying to make these air fryer buffalo cauliflower bites. I had visions of dipping the fiery morsels in a garlicky blue cheese dip to help tame the flames. Needless to say, I pretty much devoured most of what you see here. And any leftover garlic blue cheese dip is being saved to use on my next salad. Start by making the dip first so it has time to chill and flavors meld. 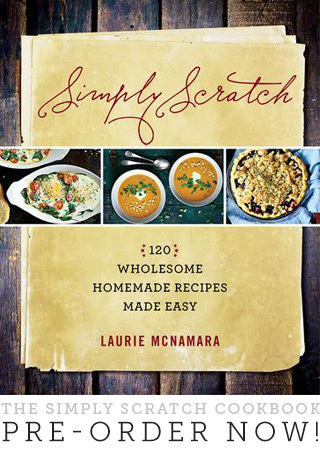 If you read my cookbook, then you know that you’re dealing with a blue cheese addict. 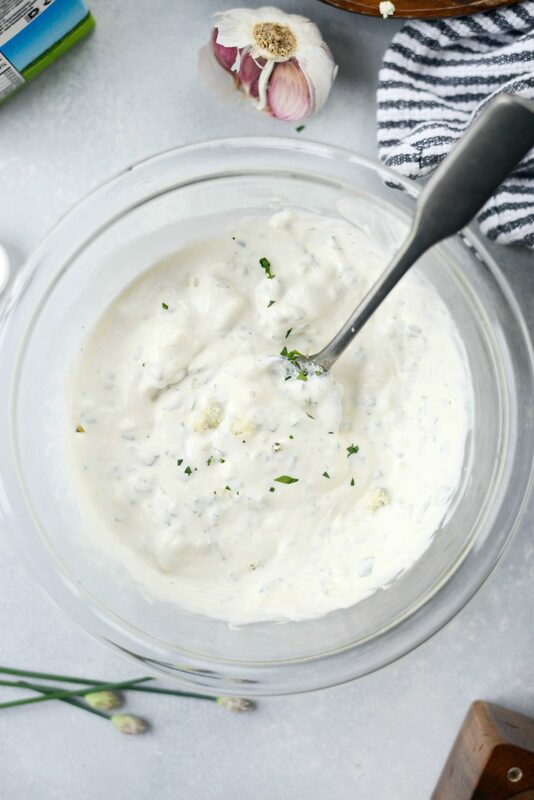 I have a million ways to make blue cheese dip/dressing and this is a simple (and garlicky!) 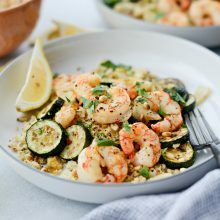 yet delicous version! 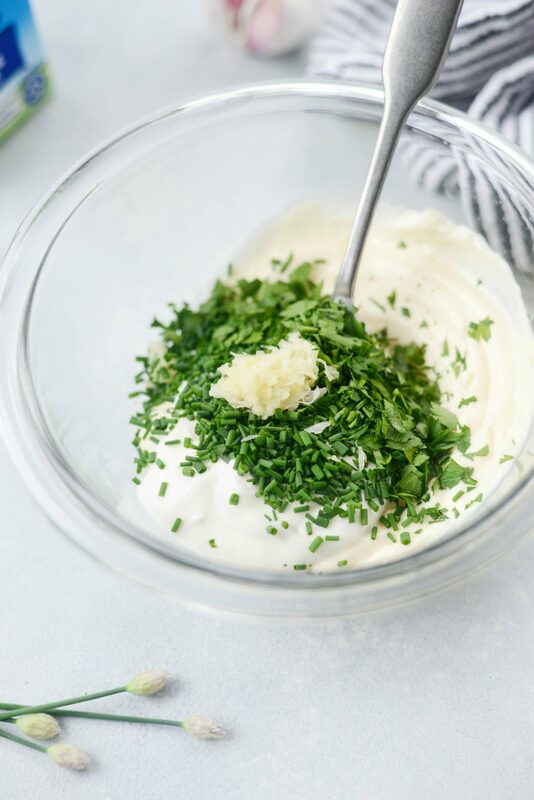 Mayonnaise and sour cream is the base, then fresh parsley and chives give it a burst of herbaceous flavors. Garlic, blue cheese (I’m using stilton) and of course salt and pepper. 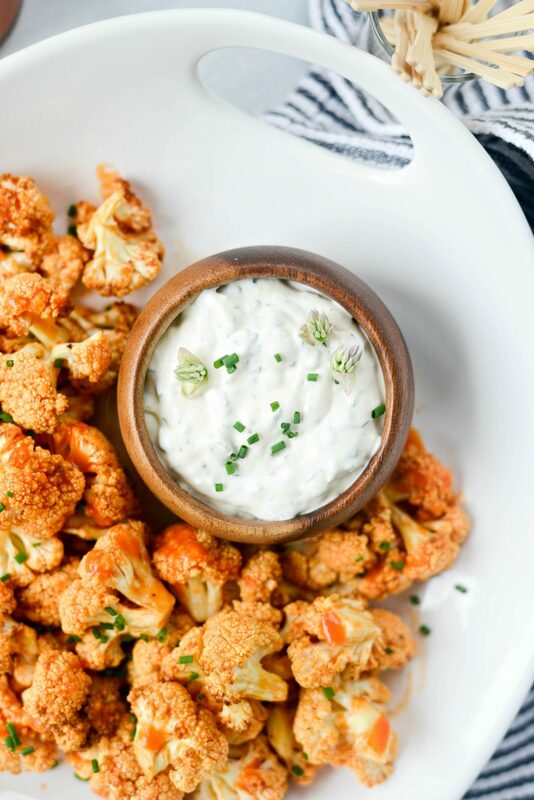 Buttermilk, heavy cream or whole milk to thin out the dip to a consistency that’s perfect for dipping these air fryer buffalo cauliflower bites. 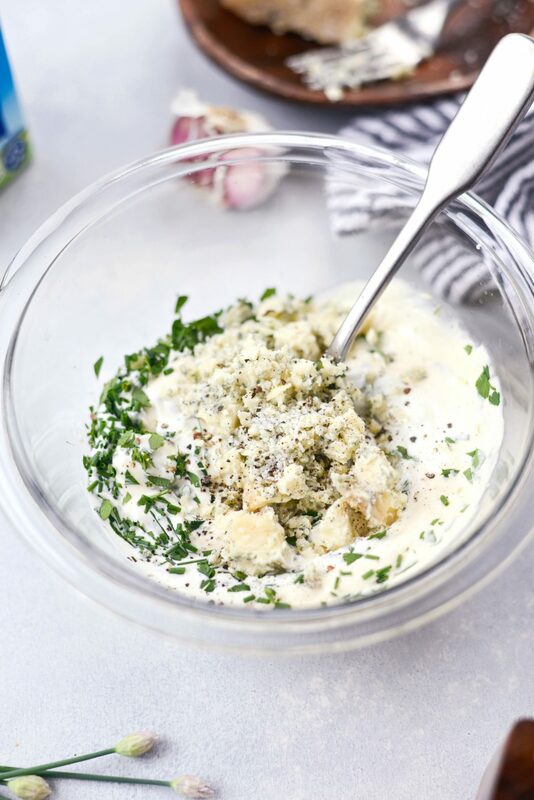 In a medium bowl, stir together 1/2 cup mayonnaise, 1/4 cup sour cream, 1 tablespoon of both snipped fresh chives and minced parsley and grate in 1 good size clove of garlic. Stir this well to break up the garlic and combine thoroughly. Lastly add in 1/4 to 1/3 cup of freshly crumbled blue cheese and season with salt and pepper to taste. Cover tightly and refrigerate for at least 1/2 an hour, but the longer the better. 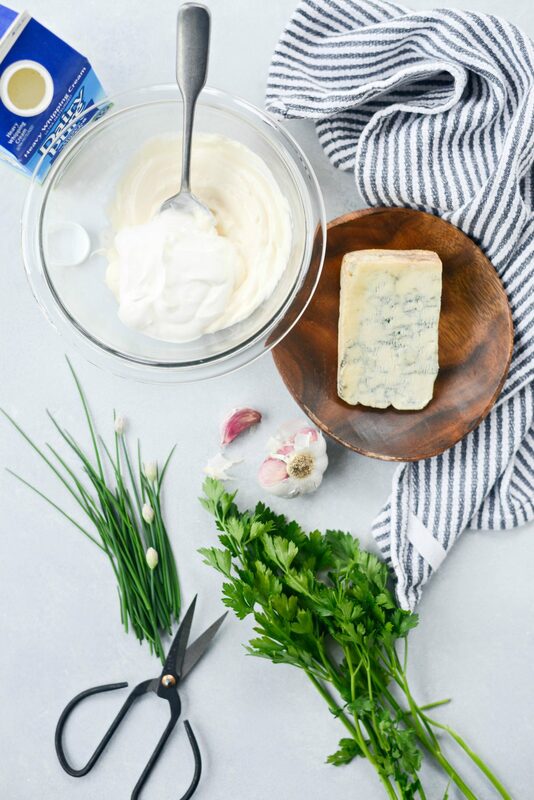 I always suggest buying wedges of blue cheese instead of pre-crumbled and here is why I prefer wedge over convenience: most times pre-crumbled cheeses are coated in cellulose to keep it from sticking and clumping. I personally feel you can get better quality and tastier blue cheese when you buy it in wedge form. Next, cut the cauliflower into large bite-size florets. They will shrink a bit in the air fryer so try not to cut any too small. 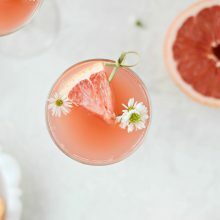 Place the florets into a bowl, spritz with olive oil or a couple teaspoons of olive oil until lightly coated and season with a pinch or two of kosher salt and black pepper. 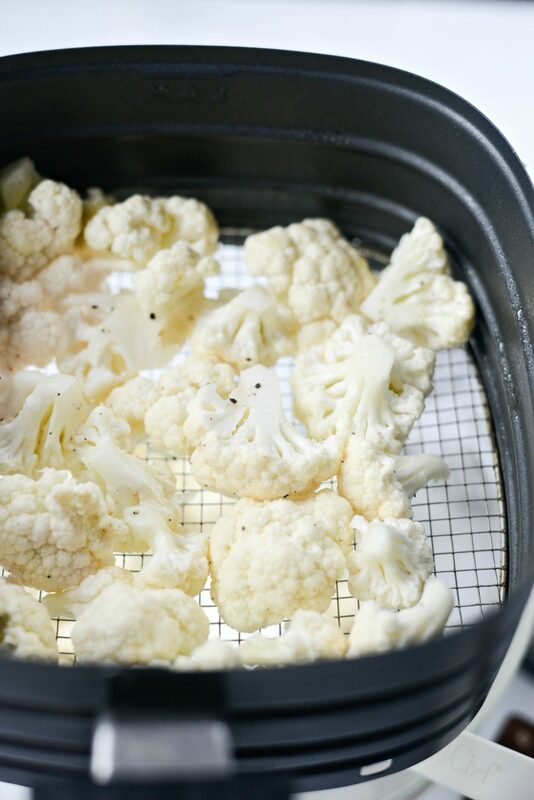 Spray the basket of your air fryer with olive oil spray. Then preheat to 390° to 400° – depending on your make and model. Working in batches of two, add half of the florets to the air fryer basket. Air fry for 4 minutes, shake and continue to air fry for an additional 4 more minutes. 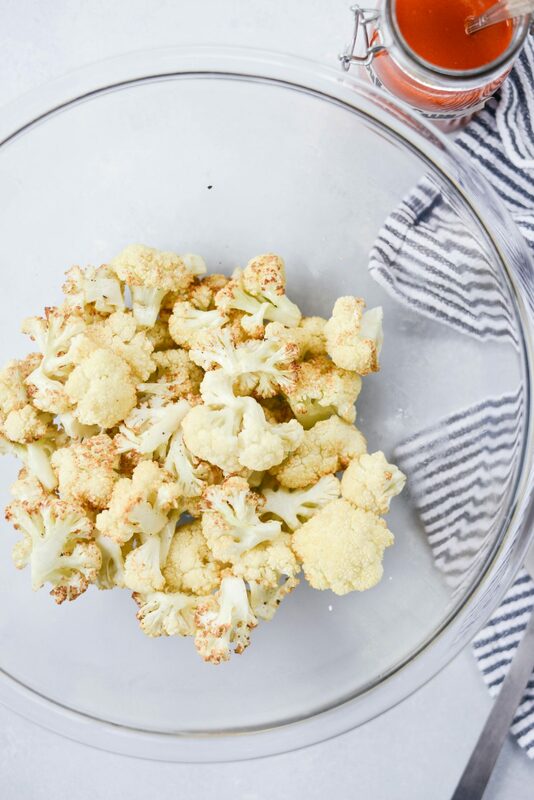 Transfer the cauliflower to a clean bowl before repeating with the second batch. Once the second batch is done, shake before adding the first batch back in to the air fryer basket with the second batch. Air fry for an additional 2 to 4 minutes. 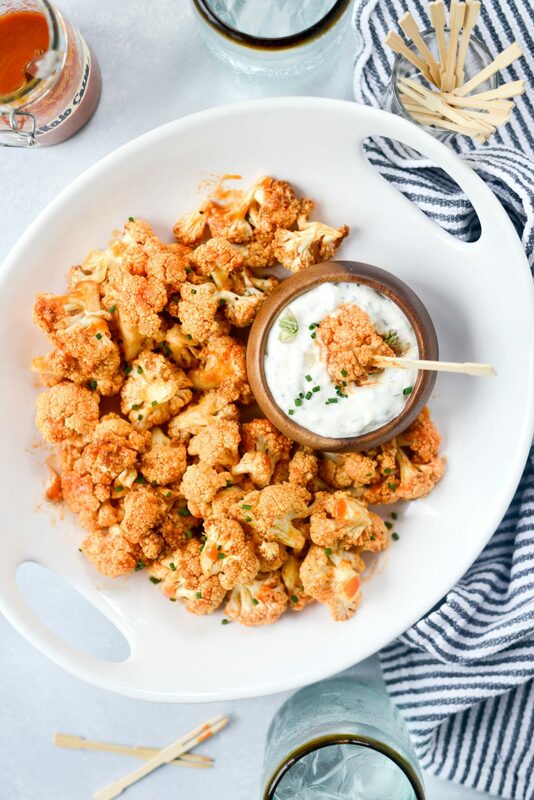 Once air fried, add the browned cauli to a large bowl and drizzle with spoonfuls of buffalo wing sauce. Use a spoon to toss to coat, adding more sauce as needed. 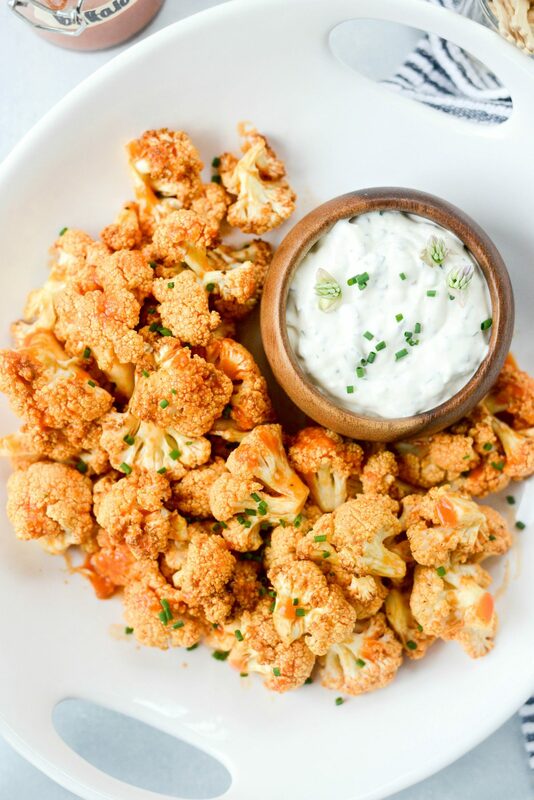 Serve the air fryer buffalo cauliflower bites alongside the garlic blue cheese dip and watch them disappear. The buffalo sauce is flavorful and perfectly spicy while the blue cheese swoops in and cools the flames. Seriously these things are addictive and maybe should come with a warning saying so. 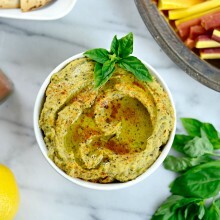 It’s the perfect as a snack or appetizer for meat eaters and vegetarians alike! I should note that the air fryer buffalo cauliflower bites still retain much of it’s natural crunch yet is tender and cooked perfectly. I was actually talking to my husband on the phone and he could hear me eating these on his end and said they sound “crunchy!’ – in a good way. Embarrassing, but truthful! However after a while they do lose a bit of the crispy factor because of the buffalo sauce, yet the vegetable crunch still very much remains. 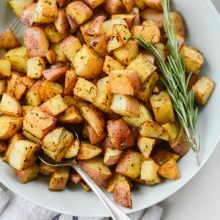 An air fryer is a counter top appliance that requires less oil (anything from a few spritz to 1 tablespoon) yet produces crispy food that rivals most deep fried foods. By using circulating hot air, it moves at a high speed so the food tends to cook in a fraction of the time. There are a bunch of different makes and models of air fryers. 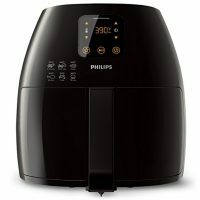 My husband did the research (as he’s known to do) and found this air fryer [affiliate] to be one of the best. But do your research and purchase one that fits your lifestyle. How is Air Frying Healthier? Air frying is healthier because only a thin layer of oil coats the food and when the hot air comes in contact it will crisp. 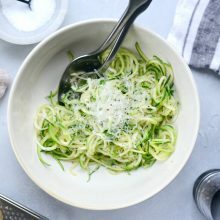 Saving you a ton of fat and calories (without sacrificing any flavor!) because food is not being submerged in a vat of hot oil. 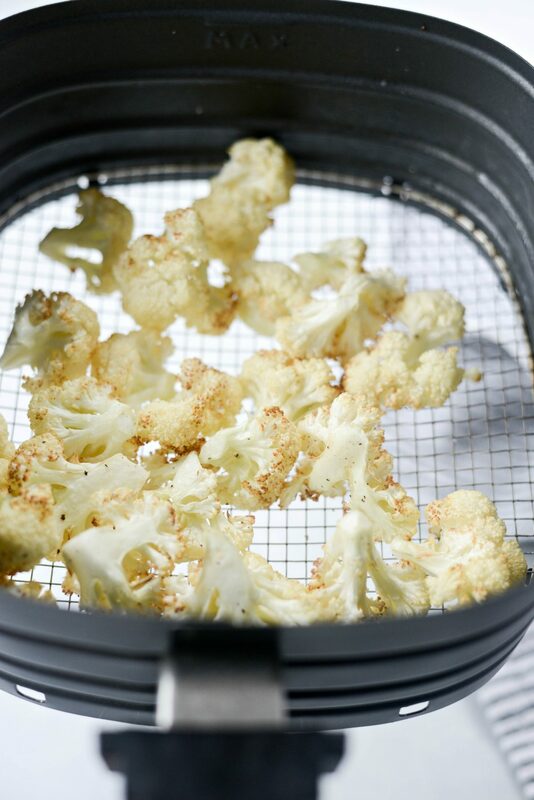 For more Air Fryer recipes, click here for my growing collection. Enjoy! 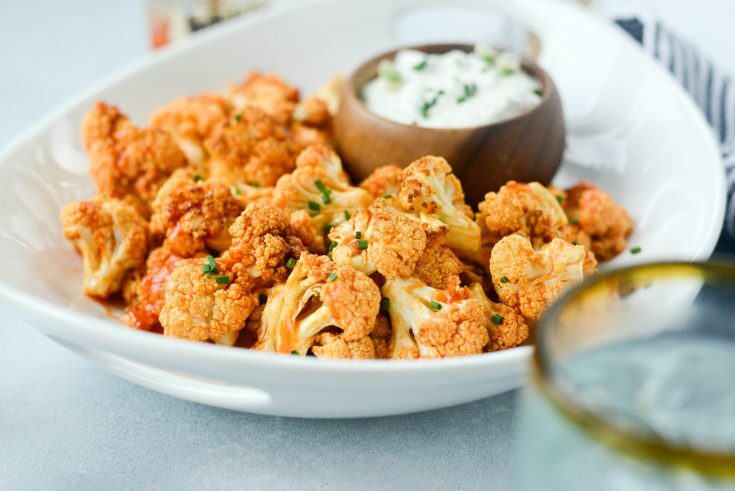 And if you give this Air Fryer Buffalo Cauliflower Bites recipe a try, let me know! Snap a photo and tag me on twitter or instagram! 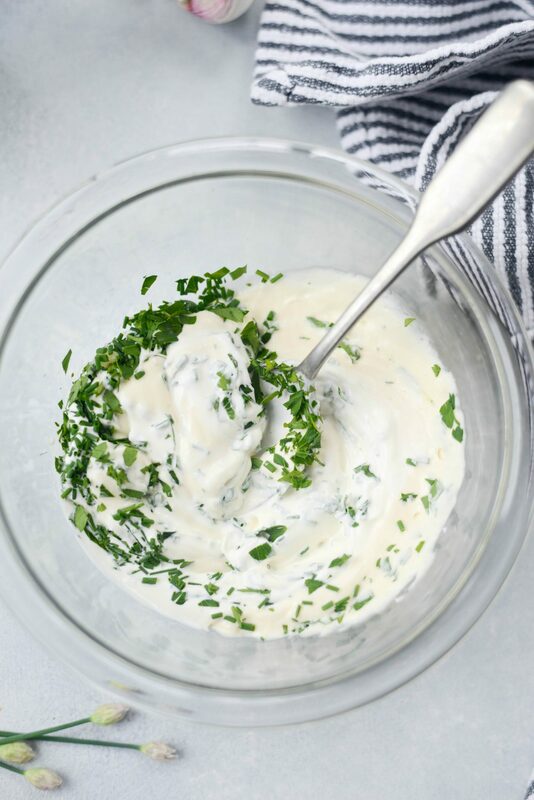 In a medium bowl stir together the mayo, sour cream, chives, parsley, garlic and combine well. Next add in the blue cheese and season with salt and black pepper to taste. 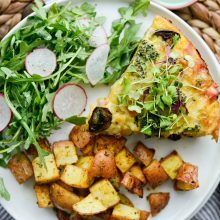 Thin out with 1 to 2 tablespoons of either buttermilk, whole milk or heavy cream until the dip reaches a desired consistency. Cover tightly and refrigerate at least 30 minutes to 1 hour (or overnight) in advance. Spray the basket of your air fryer with olive oil spray and preheat to 390° to 400° - depending on your make and model. 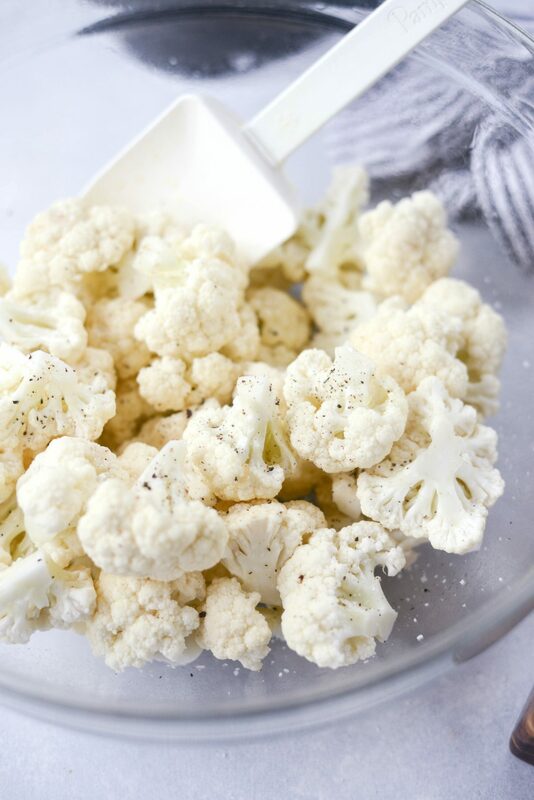 Spray the cauliflower florets with a few sprays of olive oil and season with a pinch of kosher slat and freshly ground black pepper. Once the second batch is done, shake before adding the first batch back in to the air fryer basket along with the second batch. Air fry for an additional 2 to 4 minutes. Transfer the golden cauliflower bites to the large bowl. 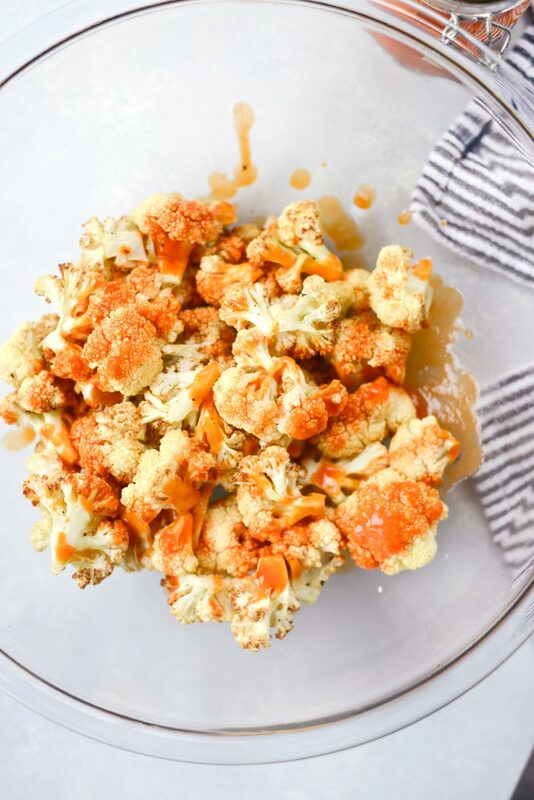 Drizzle a desired amount of buffalo sauce over top of the air fryer cauliflower and toss to coat. Serve with the garlic blue cheese dip.